This feature allows to store credit card information for the customer, so that the next time there is no need to enter all the card details. Customers will just need to re-enter the security code of the credit card they want to use. payment method exclusion setup, and sandbox/debug options. First of all, you need to configure your client credentials. To make it, fill your Client_id and Client_secret in Credentials Configuration section. Auto Redirect: If set, the platform will return to your store when the payment is approved. Exclude Payment Methods: Select the payment methods that you want to not work with Mercado Pago. Choose the status of approved orders: Sets up the order status when payments are approved. 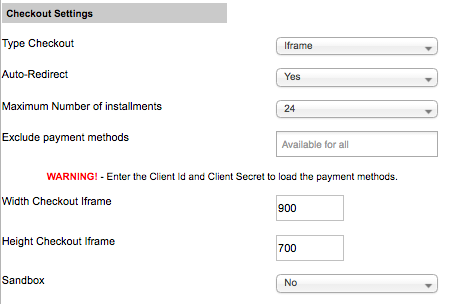 Choose the status when payment is pending: Sets up the order status when payments are pending. Choose the status when payment is process: Sets up the order status when payments are in process. Choose the status when client open a mediation: Sets up the order status when client opens a mediation. Choose the status of refunded orders: Sets up the order status when payments are refunded. Choose the status when payment was chargeback: Sets up the order status when payments are chargeback. 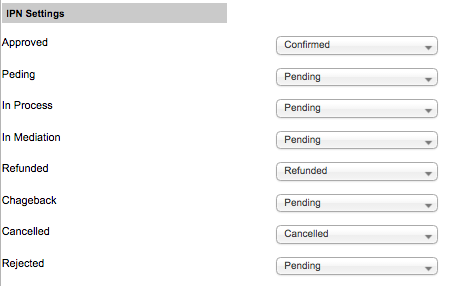 Choose the status when payment was canceled: Sets up the order status when payments are canceled. Choose the status when payment was reject: Sets up the order status when payments are rejected. Now configure your credentials. To make it, fill your access_token in Credentials Configuration section. Binary: When set to true, the payment can only be approved or rejected. Otherwise in_process status is added. Now configure your credentials. To make it, fill your public_key and access_token in Credentials Configuration section.